We make it easy for you to avoid lengthy contracts, headaches and hassles through use of our quick and easy credit application process. Our Ruud Kwik Comfort Financing representatives are a phone call away seven days a week. Kwik Comfort is there when YOU need it. You'll appreciate our quick and efficient credit processing. We'll have an answer for you within minutes, and you’ll soon be enjoying premium Ruud home comfort systems that your family and home deserve. We give you the affordable convenience of financing everything associated with your Ruud equipment—your original equipment purchase, all subsequent service, Protection Plus extended service protection, and even the comfort options that you choose to add later. With low monthly payments for equipment and service cost, a homeowner can finance qualifying Ruud products for a low monthly payment. The Kwik Comfort Financing Program offers a variety of financing options. Ask us for details. We will provide you with a professional installation of quality Ruud equipment. You’ll have the peace of mind of knowing that you have purchased a dependable Ruud system that will make your home comfortable year round for years to come. 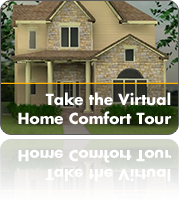 New Earth Energy, dependable home comfort from Ruud, and the Kwik Comfort Financing Program. A winning combination.